Soldier's Letter, 3 pages, 8vo., La Grange, Tenn., 12/1/62. Joseph H. Mitchell (Co. D, 17th Illinois Infantry) writes to his cousin about the occupation of La Grange, TN, Genl. Grant at Holly Springs (MS), Genl. Price, etc. 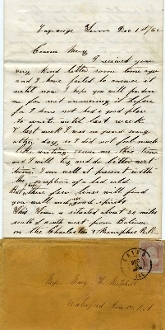 For full transcription of the letter, please see the scan. Comes with the original postally used cover. Some ink smearing, otherwise very fine.